What’s a good exercise for…? There is no hack for that. I recently read this post on DanceMagazine.com because someone posted it on the Book of Faces. (Ok. This was posted several weeks ago, I know. Sometimes, I think about stuff for a while before it turns into something I feel compelled to write about). Based on the comments that followed the post, there are parallels-a-plenty in the circus world. In fact, I have written about this before, so I know that on some level, we (many/most of us?) know that there is no quick and easy path to becoming the circus artist-athlete you want to be. And yet, one doesn’t have to wait long before a FB post will appear in which someone will ask ‘What’s a good exercise for (insert component of circus fitness here, like ‘improving my straddle’ or ‘improving my grip strength’)?’ and then the comments section will explode with suggestions and ideas. Why isn’t anyone talking about how (the thing they are asking for help with) is connected to the rest of their body? Why aren’t we talking about the more general case of regular, whole-body strength and conditioning? Because if we were, we would be less and less likely to be having conversations about (insert component of circus fitness here). (And then, I decided to start a third paragraph in a row with “And”). Looking around on the social InstaBooks, what I tend to see, more often than not, are posts asking about or addressing individual components of circus fitness. Now please don’t misunderstand, these sorts of posts, in and of themselves, are not necessarily bad or wrong. It can be a very useful thing to identify and work to address one’s areas in need of improvement. And when it comes to the offering of exercises to address such elements, we often get some good ideas, information and exercises…in fact, I’ve written a few posts about specific exercises myself. One of my most popular posts to date remains my first-ever Exercises Every Aerialist Should Do post. Always lots of hits (probably because the title includes words that people search, like ‘what exercises should I do for aerials?’). But every time I consider writing a post like that, I find myself returning to the same train of thought: yes, a given exercise might help to encourage your body to straddle wider or get your arms overhead better…but that exercise needs context. Exercises work best when they are parts of a larger whole; part of a comprehensive strength and conditioning program. 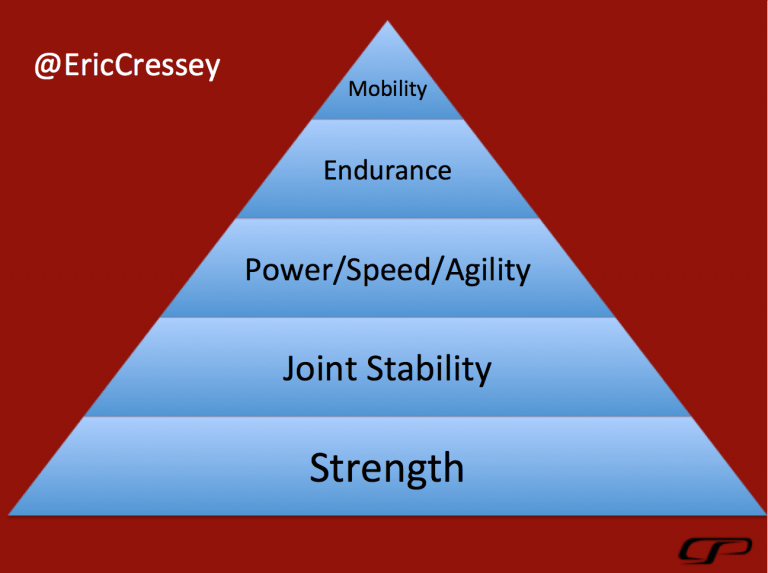 As I was formulating my thoughts into this post, I read this post by Eric Cressey on long-term athletic development. As Cressey points out in his post, the thinking that divides the various components of athleticism—or circus fitness, if you prefer—into different silos where each quality is trained separately from the others is flawed and does not reflect the reality of athletic development. EC suggests instead thinking of these various qualities—mobility, stability, endurance, strength—as a pyramid. And what is the foundation of that pyramid? Strength. That’s right: mobility depends on joint stability. Joint stability is a function of strength. I mention all of this because what I am consistently finding is that as the people I train get stronger, their bodies begin to respond better and faster to functional mobility training. Because they are regularly picking up (relatively) heavy weights, they don’t worry about developing their grip strength. Overhead range of motion improves steadily as they develop pressing strength through progressively steeper angles. Their endurance improves because each individual in-class effort ends up being submaximal compared to their workouts. And so it is that every time I consider writing a post like Exercises to help with your (element of circus fitness), without reiterating the importance of fitting such an exercise into a larger strength training plan, I wonder what am I feeding? First, the more we look for—and provide—individual exercises to address elements of the whole picture of circus strength and fitness, the more we feed the misconception that these elements are somehow separate from each other and not rooted in strength. Without having established a baseline value for regular, whole-body strength training, the more we reinforce the idea that one or two (relatively little and/or easy) things are all you need to make yourself better and to get where you want to go faster. Effectively, we are reinforcing the search for a hack or shortcut. Not because people are lazy (though, to be honest, who doesn’t like easy? ), but because the idea that your regular training regimen should include strength and conditioning in addition to your circus training hasn’t been getting the air-time it needs. D’oh. That’s right: that’s my job. I think a problem with my own messaging up until now has been that when I refer to strength and getting stronger, I know that that means simultaneously developing endurance, joint stability and mobility (among other qualities)…but I don’t think that’s been clear to everyone else. And so, after repeated bouts of the aforementioned series of thoughts, I began to indulge in doubting whether there was, in fact, much of a wider audience for what I have to share. Because after all, the basics don’t tend to get as many likes or shares as the fancy stuff. In some ways, it has been easy to drift away from writing about the various thoughts I’ve been having about strength training because I have been working with some fantastic folks—both in person and online—and just going about the business of helping them to make their bodies stronger and more resilient. And I get to share my thoughts with them. [Or perhaps it’s more accurate to say that the folks I train are kindly enough to indulge me when I have a rambling thought to share. They’re all so nice that way.] The teacher in me insists on making the training process informative and educational (in addition to being effective) because while I love working with each and every one of my clients, my goal is to teach them enough so that they can get on fine without me. To get there, it seems, involves listening to me go on and on at times about important stuff like core position and hip extension vs. lumbar spine extension. Earlier this year, at the Kinstretch certification course, a theme our instructor kept returning to was the value of being “brilliant at the basics”. That idea has been rattling around in my brain for months. And now, with help from a Facebook notification, I have decided to that it’s time for me to redouble my efforts at being a champion of the basics. In order to progress in silks or lyra or rope or handstands or straps or whatever circus art you fancy, not only will you need to train for long hours on your apparatus or in your discipline-of-choice, but to really make progress in terms of strength, endurance, stability, mobility, etc. you would do well to consider strength and conditioning to supplement your discipline-specific training. Developing and increasing strength takes time and dedication—to be explicit, what we’re talking about here in most cases is a minimum of two strength and conditioning workouts per week as a part of your regular circus-training schedule. (And no, “conditioning” at the end of class doesn’t really count). There is no hack or shortcut. (So I’ll write about how to put your workout together shortly). Improving your physical capacity and resilience doesn’t happen quickly or easily. And really, it’s not a point you arrive at so much as it’s an ongoing part of your larger physical practice. The second of the two factors confounding things is that circus arts classes are often marketed as something you can do instead of going to the gym. I think you see how that ends up being somewhat problematic at some point down the road. Now, to be fair, there is room for a whole separate essay on the tension that exists between what our culture, mass media and the fitness industry have done to make weight training inaccessible and unappealing to so many people and the fact that there are so many overwhelmingly positive health outcomes associated with strength training and the accompanying development of muscle mass. …when what’s probably closer to the truth is to say that your circus arts training will very quickly become the reason you go to the gym. Of course, it doesn’t have to be a gym, but I am going to stand by the use of weights and external resistance as the most effective way to develop the well-rounded strength that makes for a strong and mobile circus body. And I know that there are coaches out there who regularly encourage cross-training, and I love them for it. But in the name of clearer messaging: Strength training should be your “main dish”, so to speak. After that, if you feel like having a “side dish”, like Pilates or Yoga or some other sort of exercise class, go for it. They all bring additional value to the table. Just remember not to fill up on “side dishes” before you have the “main course”. As an example of how our messaging about physical progression is flawed, consider the question “what’s a good exercise to help me to open my hips for my straddle?” Typically, a question like this will reveal everyone’s favorite flexibility drills, stretches or exercises, but what about considering why this person’s hip are “tight” in the first place? There are a number of things that we can consider: What if their hips are tight because their hamstrings and adductors are functioning as prime movers instead of synergists because the glutes are underactive? Strength training can help with that. What if it’s tied to underactive and under-strong core musculature? Again, a well-designed strength training plan can help with that. Heck, what if their ankle range of motion is restricted? (That’s a weird one…but the body is delightfully weird sometimes). Again, there’s a strength training plan for that. If any of the above were to be the case, we would begin to see (something we already know) that addressing hip mobility requires a strategy that takes into consideration the fact that muscles and joints don’t function in isolation. At the risk of sounding cliche, it’s all connected. And since it’s all connected to the whole, it demands a more holistic approach. A whole-body approach. This is what I mean when I refer to the basics. Going forward, if you find yourself wanting to improve your straddle, go deeper into your split, improve your overhead range of motion…or whatever element of your circus fitness…before seeking out specific exercises to help with that, look first to your strength and conditioning routine. Make sure you’re addressing balanced and functional whole-body strength. My suggestion would be to get a strength coach to take you through a thorough movement screen. Or see a physical therapist for an assessment and then ask them to work with your strength coach as they build a program for you. That way, you can be sure to get ‘all of your bases covered’ and then any supplemental exercises you add from there are far more likely to be effective. Of course, if you’d like to work with me, you can follow the links to apply for my distance coaching program or you can find me at Esh Circus Arts in Somerville, just outside of Boston, Massachusetts, USA. Whatever path you choose, I hope you found this helpful and thanks for reading! Hey, I thought I would simply mention how much I enjoy reading these posts, and how much they have helped me to be smarter about my training.